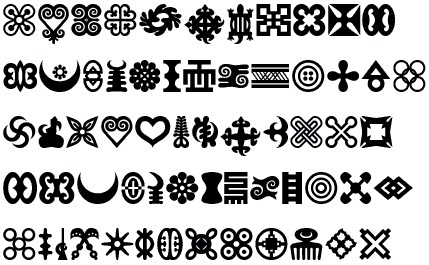 Today, we will talk about Adinkra symbols of the Akan people of Côte d’Ivoire and Ghana. The Adinkra symbols are believed to originate in Gyaman, a former kingdom in modern day Côte d’Ivoire. According to an Ashanti (Asante) legend, Adinkra was the name of a king of the Gyaman kingdom, Nana Kofi Adinkra. King Adinkra was defeated and captured in a battle. According to the legend, Nana Adinkra wore patterned cloth, which was interpreted as a way of expressing his sorrow on being taken to Kumasi, the capital of Asante. He was finally killed and his territory was annexed to the kingdom of Asante. 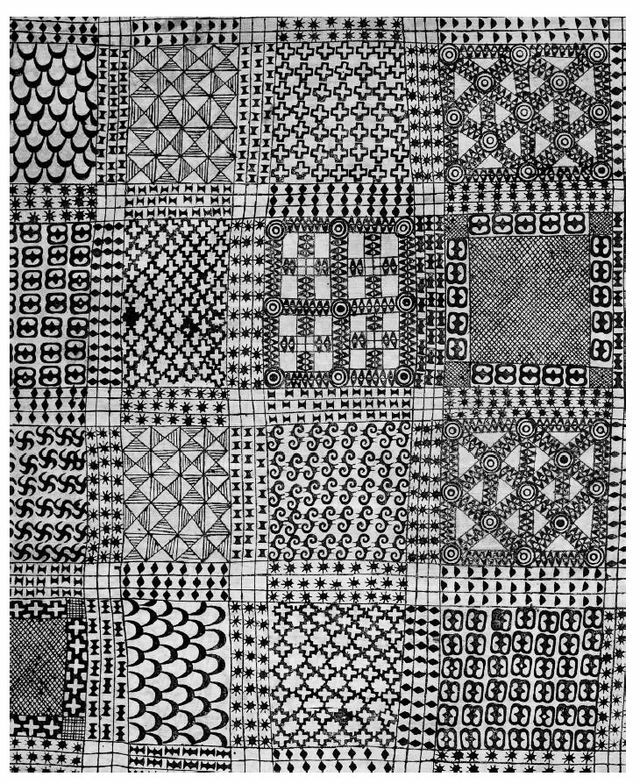 The Asante people, around the 19th century, took to painting of traditional symbols of the Gyamans onto cloth, a tradition which has remained to this day. The arrival of the adinkra in Akan culture seems to date as far back as 1817, when the English T.E. Bowdich collected a piece of adinkra cotton cloth from the city of Kumasi. The patterns on it were printed using carved calabash stamps and a vegetable-based dye. 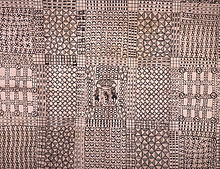 The cloth featured fifteen stamped symbols, including nsroma (stars), dono ntoasuo (double Dono drums), and diamonds, and is currently hosted at the British Museum in London. 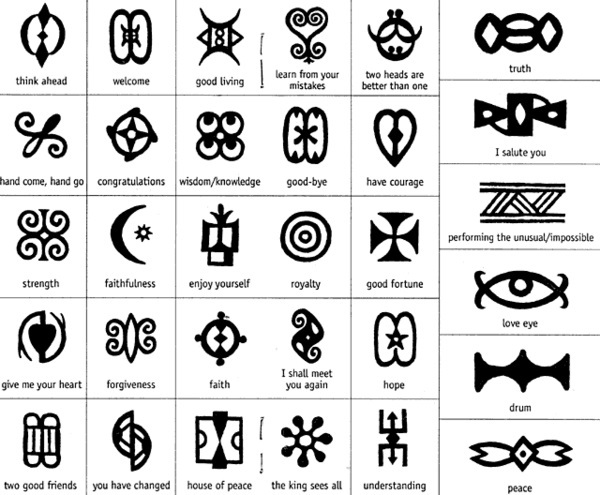 Adinkra symbols are visual representation of concepts and aphorism developed by the Akan people of Ghana. Adinkra symbols are extensively used in fabrics, pottery, logos, and advertising. They can also be found on architectural buildings, as well as on traditional Akan gold weights, and sculptures as well as stools used for traditional rituals. The adinkra symbols are not just decorative objects, or drawings, but actual messages conveying ancient traditional wisdom relevant to aspects of life or the environment. A lot of the Adinkra symbols have meanings linked to proverbs, such as the sankofa symbol. 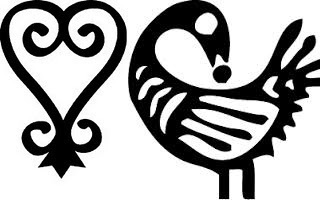 Sankofa, in the Twi language, translates in English to ” reach back and get it” (san – to return; ko – to go; fa – to look, to seek and take) or the Adinkra symbol of a bird with its head turned backwards taking an egg off its back, or of a stylised heart shape. It is often associated with the proverb, “Se wo were fi na wosankofa a yenkyi,” which translates “It is not wrong to go back for that which you have forgotten.” Other Adinkra symbols depict historical events, human behavior and attitudes, animal behavior, plant life, and objects’ shapes. Adinkra means ‘goodbye’ or ‘farewell’ in the Twi language of the Akan ethnic group, to which the Asante belong. No wonder the Akan people, and particularly the Asante, wore clothes decorated with Adinkra symbols mostly for funerals as a way to show their sorrow, and to bid farewell to the deceased. Adinkra cloths were traditionally only worn by royalty and spiritual leaders for funerals and special occasions. They were also hand printed on undyed, red, dark brown, or black hand-woven cotton fabric depending on the occasion and the wearer’s status. Today, adinkra is worn by anyone, women, men or children, and it is frequently mass-produced on brighter colored fabrics. The 3 most important funerary Adinkra are: the dark – brown (kuntunkuni), the brick – red (kobene), and the black (brisi). There are however, other forms of which cannot be properly called mourning cloth. Their bright and light backgrounds classify them as Kwasiada Adinkra or Sunday Adinkra meaning fancy clothes which cannot be suitable for funerary contents but appropriate for most festive occasions or even daily wear. The center of traditional production of adinkra cloth is Ntonso, 20 km northwest of Kumasi, the city where the Englishman was first given it in 1817. Dark Adinkra aduro pigment for the stamping is made in Ntonso, by soaking, pulverizing, and boiling the inner bark and roots of the badie tree (Bridelia ferruginea) in water over a wood fire. Once the dark color is released, the mixture is strained, and then boiled for several more hours until it thickens. The stamps are carved out of the bottom of a calabash piece, and measure on average 5 to 8 cm2. Enjoy the video below on Adinkra, and the articles on HartCottageQuilts.com, Adinkra in Ntonso with gorgeous images of the process of making Adinkra stamps and clothes, and lastly GhanaCulture. my web site!I suppose its good enough to make use of some of your ideas!! I love your tattoo symbols. My favorite is my new one Transformation. Thanks Leslie, they are indeed beautiful! I would like to honor Virginia’s Olympic athlete, originally from Ghana, with a piece of jewelry using the Nkyinkyim (twistings) symbol. What I understand is that this symbol represents surviving hardships, and a symbol of initiative, dynamism and versatility. Would this be a complementary symbol and gift? Hi Frances, that will be such a lovely gift indeed! It says so much, and is quite an honor! I am sure she would love it! Would like to incorporate Adinkra symbols into a wall quilt, but do not want to offend. Appropriate? Thanks!